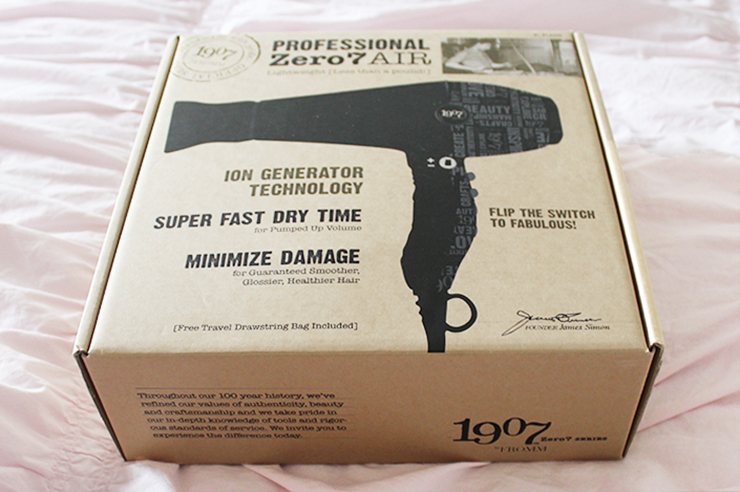 When I was asked to test the 1907 by Fromm Zero7 Air Lightweight Dryer I jumped at the chance! The company told me that "the revolutionary blow dryer is a professional’s – and now a consumer’s! – dream: versatile, durable, extremely quiet, and super lightweight." I usually hate drying my hair because it is so noisy, and the dryer is so heavy that I get tired from it; needless to say I was excited at the promise of a quiet and lightweight hair dryer. In addition to being light and quiet the hair dryer has many other qualities that are beneficial to your hair and how you style it. It uses negative ions to break down water and speed up drying time, which in turn reduces damage to hair. Moreover negative ions help to seal the cuticle and eliminate frizzing. 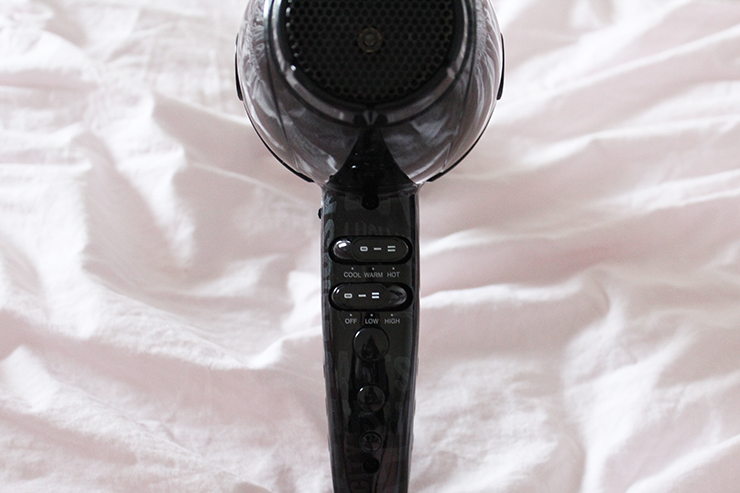 With the flip of a switch though you can use positive ions to volumize hair. The dryer also features two speeds and three different heat settings, which makes it easy for you to choose the temperature you want. Furthermore, the 1907 by Fromm Zero7 Air Lightweight Dryer is anti-static, has an extra long cord, comes with a concentrator and diffuser, and has 2,000 life hours (a typical hair dryer only has 800 hours). 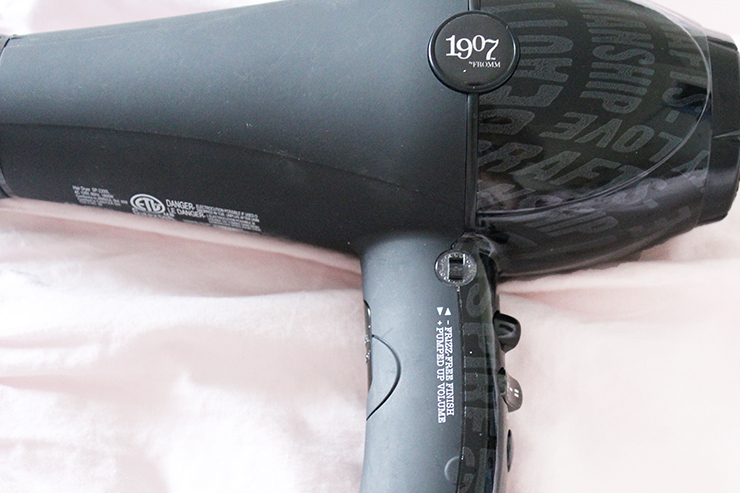 I have been using the 1907 by Fromm Zero7 Air Lightweight Dryer for a few months now and I have to say it is the best hair dryer I have ever used. 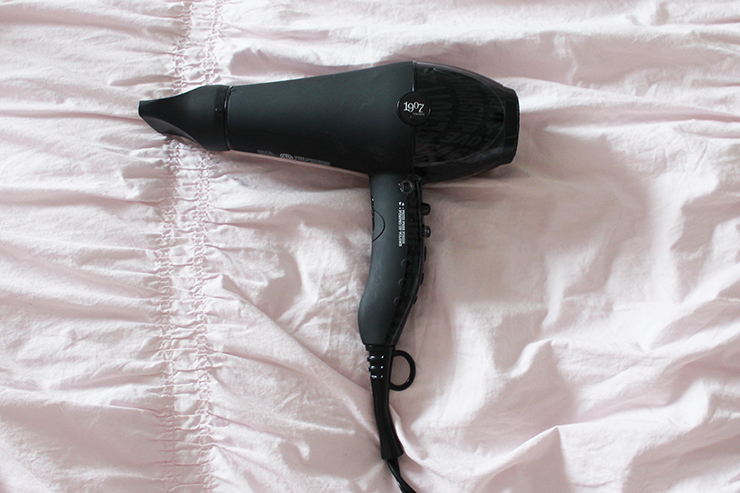 My favorite feature is definitely its weight, it's so light, which makes drying my hair much easier. 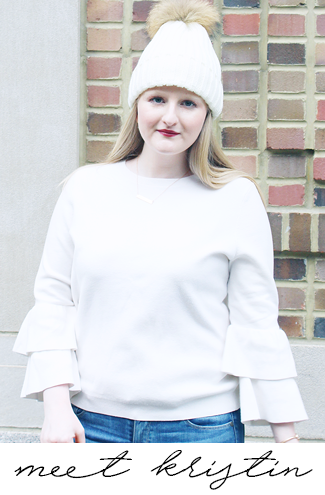 I really cannot say enough about how important the lightweight is for me; I have a chronic pain condition, which can make drying my hair miserable at times because of the heavy weight of most hair dryers, but I never have that problem with this. Additionally, it's one of the quieter hair dryers I've used and dries my hair very quickly, which are both big pluses in my book. Another feature I love is option to switch between different heat settings; I use the hot setting to help get the initial moisture out of my hair, then use the warm setting for the majority of my drying to minimize damage, and finish with the cool setting to help seal the cuticle. The ion generator switch on the side, which allows you to choose from negative or positive ions, really helps you to go between voluminous and sleek looks. My hair also feels softer after using this then it has with previous hair dryers. 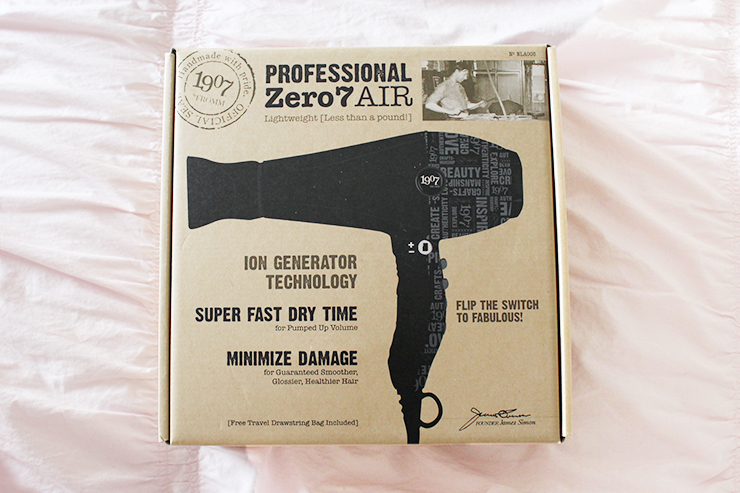 I've used a lot of different hair dryers over the years and I have to say that 1907 by Fromm Zero7 Air Lightweight Dryer is the best I've ever used and my favorite. Not only does it make my hair look better and minimize the damage, but it makes drying my hair easier and more enjoyable with its light weight and quiet fan. If you're in the market for a new hair dryer I would highly recommend checking this one out, you will not be disappointed. *I was given the 1907 by Fromm Zero7 Air Lightweight Dryer by Skirt PR to facilitate my review, however opinions of this product are all my own. Love this review! Sounds like I need a new hairdryer! I agree, these are the same reasons that I hate blowdrying my hair too! This hairdryer sounds great! This seems like a great hair dryer! I'll definitely have to look into this one! My arms get so tired drying my hair. Been looking for a good lightweight dryer, thanks for sharing! I never blow dry my hair because it always hurts my arm from holding the hair dryer for so long! Lightweight hair dryer? YES PLEASE! I hate drying my hair but this guy looks like it would be way more enjoyable! I really want to try a blow dryer with a diffuser so I'll have to check this one out! I usually air dry but this dryer seems great! My dryer blew out overseas I've been in the market for a new quality one! I've been looking for a new hair dryer! Mine is totally dying and hardly get's hot anymore..I'll have to check this out! This dryer sounds like exactly what I need; I have waist-long hair, and by the time I'm done drying it, my hand is about ready to fall off! Haha! I am so bad at paying attention to good hair products and tools, I will spend a million dollars on makeup but I just don't care as much about hair. My curling iron is from target and so is my dryer.